Here’s an idea that I came across yesterday. What made it more interesting was that I very confidently expected it wouldn’t work! If you use Dropbox, you may know about its Public folder. 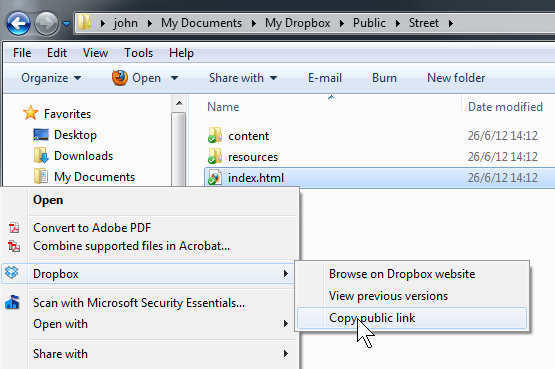 You put files in it and can right them and choose “Copy public link” from the context menu. You can paste the link into an email or instant message and the file can be shared with friends or colleagues who may not themselves have Dropbox installed. It’s quick and easy for everyone. Almost idiot-proof. Well, yesterday I was bouncing ideas around for someone who needs an alternative to iDisk (as I understand it, Apple are withdrawing it, whatever it is!). A couple of us had suggested Dropbox for sharing big files and attention then turned to a really, really simple way of sharing web galleries. You can in fact share web galleries from your Dropbox folder. You just output a web gallery from Lightroom and save it in Dropbox’s Public folder. In Explorer / Finder you right click the gallery’s index.html file and “Copy public link”. You can then share that link with anyone. Dan, I accidentally deleted your comment – it fell into spam and I hit Empty just as I saw it was a real comment. Would be grateful if you could report it. Sorry! Thanks for the info, Alex. I didn’t know about that restriction, though I’m not totally surprised. On the other hand, if you read the start of that link “All the extra functionality provided by the Public folder is now accessible anywhere in your Dropbox”. Am I right there? I made a quick trial with a LR4 gallery. It works with the gallery inside “Public” ,using “Copy Public link”. It didn’t work with the gallery inside “Photo” and “get link”, which is the only link available.So?